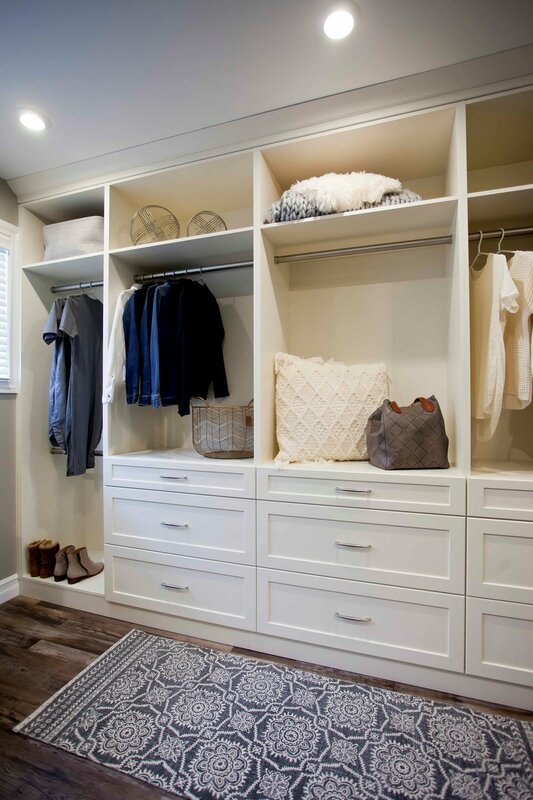 These clients wanted as much closet space as we could fit! To make it happen, we combined two small back bedrooms on either side of the hallway to make one large master suite. Pre-Renovation, our clients had one small bedroom that fit a queen size bed and almost zero closet space. The focus was the closet. The homeowners only wanted just enough space to comfortably fit a king size bed and end tables in the bedroom area. The rest was closet, closet, closet! We chose to do a wide, double barn door application to serve as a division line between the two spaces while keeping the new space feeling open. Space in general was a challenge. The custom cabinetry in the closet was designed to carefully make use of every square inch. Numerous solutions were incorporated to maximize storage. Special accessories such as pull-out pant racks were installed to keep suit pants organized. Custom drawer dividers are a terrific way to help keep smaller items such as socks, belts or jewellery tidy and easy to find. The shoe shelves were designed to make use of the space under the window and this cabinet now houses our homeowners impressive shoe collection! This was a wonderful project, and we were excited to have had the opportunity to be a part of the planning and installation process from start to finish. The result is a beautiful and functional new bedroom and walk-in closet that suits our clients home and lifestyle. The shoe shelves were designed to make use of the space under the window. Custom drawer dividers were installed to keep jewellery tidy and easy to find! "We are so happy with our new bedroom and closet. Christa from Workshop Cabinets & Design was so helpful with the design and picking our colours and cabinets. She was very efficient and professional and a great organizer with everyone involved. Thanks again-we love our new room and especially my dream closet!"